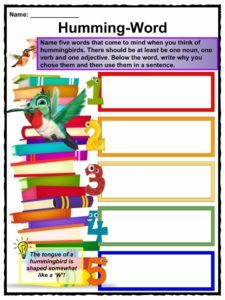 A hummingbird is a bird that flaps its wings so fast in flight that it makes a high-frequency humming sound and appears to hover. A hummingbird is a bird that flaps its wings so fast in flight that it makes a high-frequency humming sound and appears to hover. It is one of the world’s smallest bird species and belongs to the Trochilidae family. It is known for its small, lightweight physique, long bill, rapidly beating wings and powerful senses of sight and hearing. 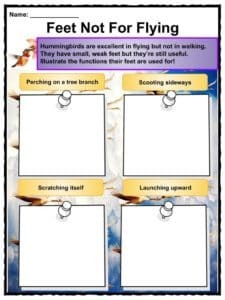 See the fact file below for more information on the hummingbird or alternatively, you can download our 23-page Hummingbird worksheet pack to utilise within the classroom or home environment. Hummingbirds are native to the Americas with the most species in Central and South America and the Caribbean. 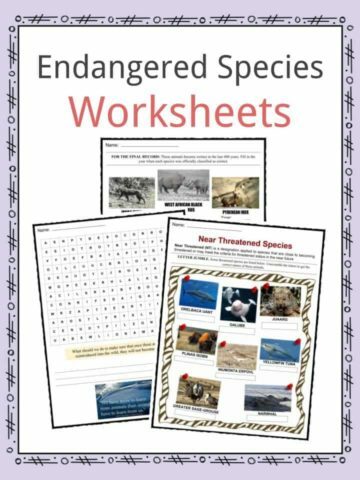 Eight species are found in the United States. Various sources claim that there are 325 to 338 species of hummingbird, making them the second largest family of birds next to the Tyrannidae family. At least 140 hummingbird species breed in the Andes mountain range. The average lifespan of a hummingbird is 5 to 10 years. Hummingbirds are able to fly efficiently because they have lightweight feathers and feet. Hummingbirds have such small feet that they cannot walk or hop properly with them, but they can use them for preening, perching, scratching themselves, scooting sideways, and launching upward. A hummingbird’s wings is one of its powerful parts. Between 25 – 30% of a hummingbird’s weight is flight muscle. They fly like insects by inverting their wings. They are the only birds that can fly backward, sideways, up, down, and even hover in mid-air. They can fly at 25 to 30 miles per hour. A hummingbird’s wings beat 50 to 200 per second. Its heart beats approximately 1,200 times per minute and it breathes 250 times per minute. Their flight technique requires a lot of energy so they need to eat a lot too. Hummingbirds feed mainly on nectar, but they can also sip tree sap, juice from fruits, or eat small insects. During cold nights or when fatigued, hummingbirds go into torpor. Torpor is a type of hibernation wherein the birds reduce their temperature and metabolic rate to save energy. Hummingbirds have powerful vision. They can see further than the human eye and can also see colors that the human eye can’t. This is because their eyes can process ultraviolet light. They also have excellent hearing but lack a sense of smell. 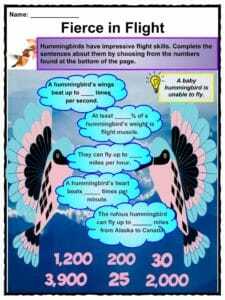 Of all birds, the hummingbird has the fewest feathers and the largest brain, relative to its size. Its brain makes up 4.2% of its total body weight. 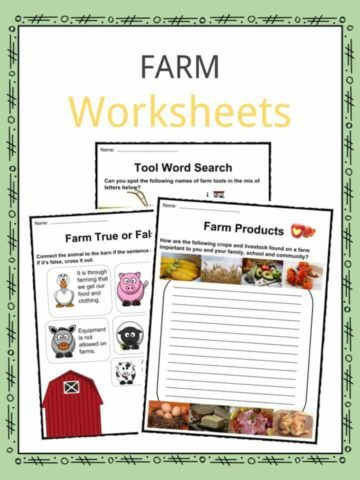 They have excellent memory and are able to remember every flower they’ve been to. They are classified into nine main groups or clades: the topazes and Jacobins, hermits, the mangoes, the coquettes, the brilliants, the mountain gems, the bees, the emeralds, and the giant hummingbird (Patagona gigas). 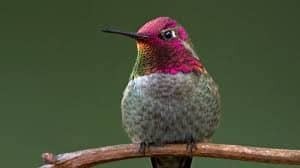 The smallest bird in the world is the bee hummingbird, also known as the Helena hummingbird, which is 2.25 inches long and found only in Cuba. The smallest bird in Canada and the United States is the calliope hummingbird, which measures 3 inches long. The largest species of hummingbird is the giant hummingbird (Patagona gigas). 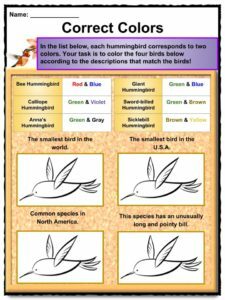 A common species found in North America is Anna’s hummingbird. They are medium-sized, short-billed and broad-tailed. They are commonly green and gray in color. Males have reddish feathers covering their heads and throats. The sword-billed hummingbird got its name from its extremely long and pointy beak measuring up to 4 inches. Another species with an unusually long bill is the long-billed hermit. Another species that is easy to identify is the sicklebill hummingbird because of its bill shaped like a sickle. The two types of sicklebills are the buff-tailed and white-tipped sicklebills. Hummingbirds have different migration patterns and habits, depending on the species. It’s not common for hummingbirds to migrate in flocks. Individual birds, like the ruby-throated hummingbird, flies northward across the Gulf of Mexico during spring and full. A species of hummingbird known for its feisty territorial trait, extraordinary flight skills, and the longest migration pattern is the rufous hummingbird. It flies up to 3,900 miles from Alaska to Mexico. The difference between ruby-throats and rufous hummingbirds is their adaptation to cold environments. Ruby-throats don’t adapt well to the cold unlike the rufous hummingbird. Female hummingbirds lay only two eggs and build a nest in preparation for laying. Hummingbirds don’t mate for life. When the eggs hatch, the babies will stay in the nest for three weeks and the male will go look for another mate. 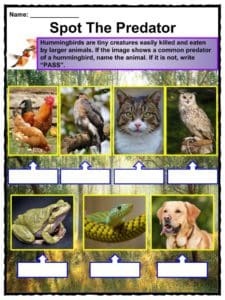 Honeyeaters, sunbirds and hummingbird moths are commonly mistaken for hummingbirds. Predators of hummingbirds include cats, snakes, praying mantises, lizards, sharp-shinned hawks, owls, large frogs and even large spiders. 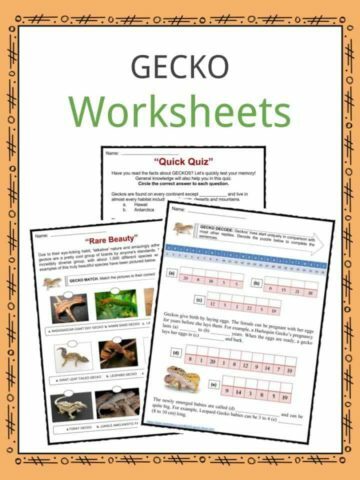 This is a fantastic bundle which includes everything you need to know about hummingbirds across 23 in-depth pages. 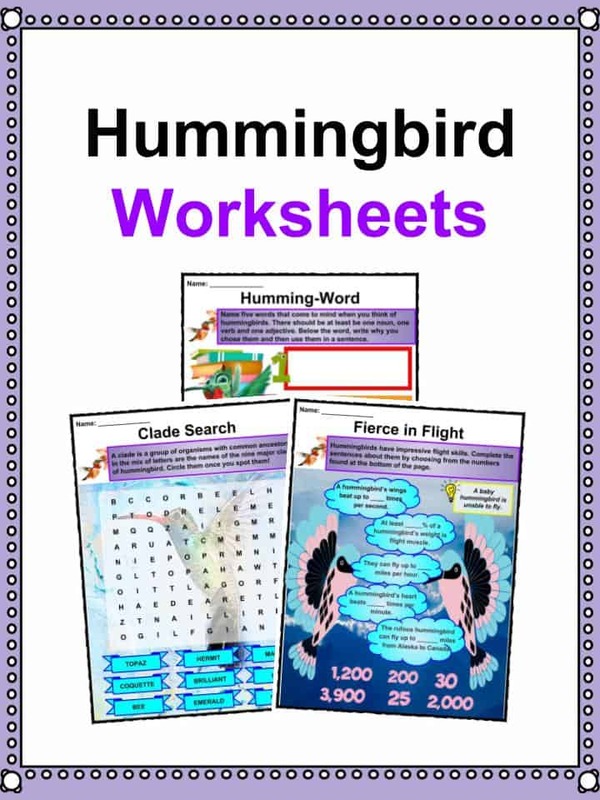 These are ready-to-use Hummingbird worksheets that are perfect for teaching students about a hummingbird which is a bird that flaps its wings so fast in flight that it makes a high-frequency humming sound and appears to hover. It is one of the world’s smallest bird species and belongs to the Trochilidae family. It is known for its small, lightweight physique, long bill, rapidly beating wings and powerful senses of sight and hearing.